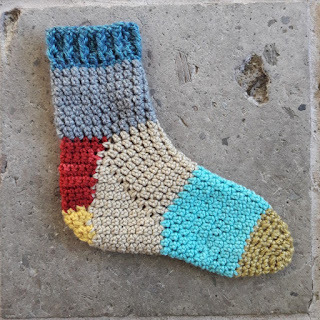 The class I'm teaching at Houston Fiber Fest "Crochet Sock Techniques" is just four weeks away so socks are in my dreams and dominating my life right now. I happily knit socks years ago merrily following the pattern without thinking too much. But it's being different being a teacher. They ask you questions. Helping a workshop attendee in the yarn store with their socks I realized I had no idea what turning the heel entailed or what exactly a gusset was. I only had the vaguest idea of how a sock was actually constructed. So when one of my longtime students wanted to learn to crochet socks I had a duty to find out and so the pursuit of the ultimate crochet sock began. I have made a color-coded sock for my class as a teaching aid. I got this great idea from Karen Whooley's fabulous pattern book "I can't believe I'm crocheting socks". I finally cracked crochet socks with the help of this book. And I now know where the elusive gusset is. My demo sock is the basic cuff down version and each part is a different color - cuff, leg, heel flap, heel turn, gusset area, foot and toe. It's going to be very helpful. 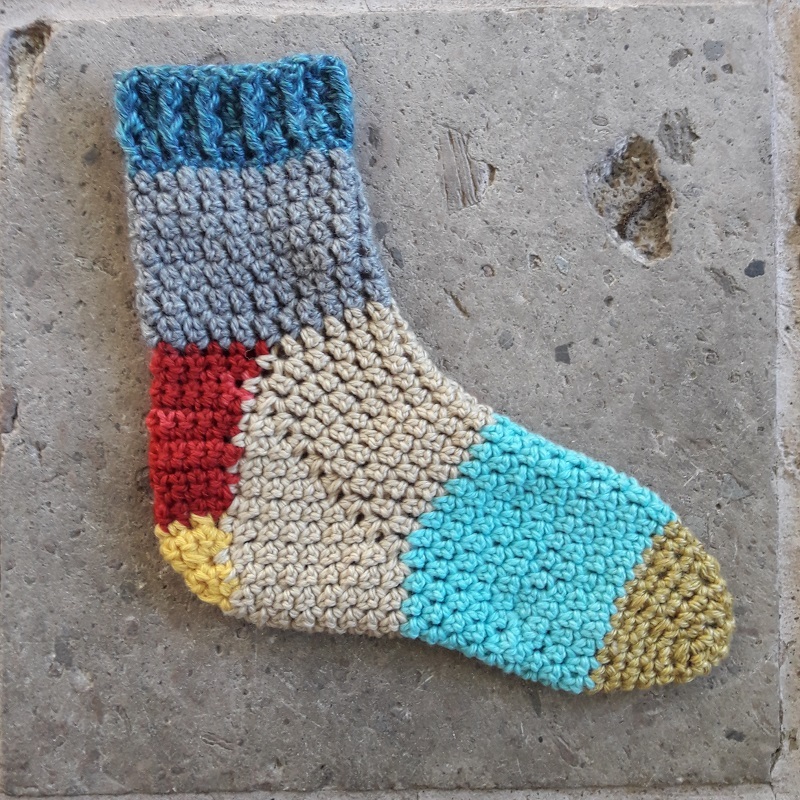 And my crochet sock fame has spread and the lovely Claudia of the Crochet Luna Podcast in California asked me to be her "resident crochet sock expert" earlier this month on her new Ravelry thread "Sock it to me" - how cool is that? - so you can join me over there if you'd like to show us your socks or chat about the merits of different heel constructions and the like... How fun! And if you're near Houston Texas I know there are still places on my crochet sock class on June 25th. I'd love to meet you in person! Grab your spot here. A message for the only crochet sock expert in my family. Love the podcast. Hope the Houston Fest goes well for you .Sure it will with that fantastic colour coded sock as a great example. Mh..wish I were nearer and could put my name down for one of those empty slots. Thank you Mum! Oh yes I wish you could come to my class too! It's going to be FUN! Ha ha Nicole. That comment was a little tongue in cheek...I'm famous on a small scale! !